“Find something that you love. Something that gets you so excited you can’t wait to get out of bed in the morning. Forget about money. Be happy.”Chris Gardner. I would like to thank all my visitors and friends who has visited me, commented on my posts both on my page and website.You have encouraged me to do what i have proposed to do one year back. Whether your are my recent visitor or you are with me from the beginning, Whether you are a silent reader or a one who always is there to boost up spirits with your comments….YOU are a big support and i am Humbly Thankful to you.It’s been an awesome year and that is all because of you friends. Tehmina Asif , my cousin a child hood friend.She is a very energetic and enthusiastic girl.She herself is an excellent cook, a lot of recipes i have learned from her. Amber Saleem, She is the one who is with me from the day one and she is the one published a lot of my recipes in KhanaPakana,a famous website. Mahira Asif, Home baker a darling friend of mine, I myself inspired from her baking skills.She on every step encouraged me. Sabah Zeeshan,she is not an enthusiastic cook but one thing i like her most…she is a genuine support from day one. Arifa Rais,my cousin and a good friend.She is not a regular visitor but i know she is my big support. Laila Asim,she is a Super Talented lady, very hard working and enthusiastic.I have learned a lot of things from her.She is the one whose comments are worthwile for me. Ayesha Wajid,She is my regular visitor and a friend,running her own catering business.Always supported me and boosted up my spirits. Rafeeda, Raf is an amazing lady with a friendly nature,I guest posted for her blog very first time and i was very much confused,but she guided me and made the task easier for me.That was a very nice experience. Sajina Bishar, thou she is not actively running her blog these days because of personal problem but she is such a nice lady , i first time participated in her contest and was a runner up.I always miss her posts.Hope she will be back soon. Minal Gul, She is a teenager enthusiastic cook,she is super talented with making her cooking pictures graphics. How can I forget My Teacher and incredibly big supporter of my page and blog.He is such a Humble and nice person.On my request he judged my website’s contest and from that day his endless encouragement and invaluable learning from him enhanced my skills…thou i am still in learning process and he is my inspiration…CHEF ASOK KUMAR RAJ. 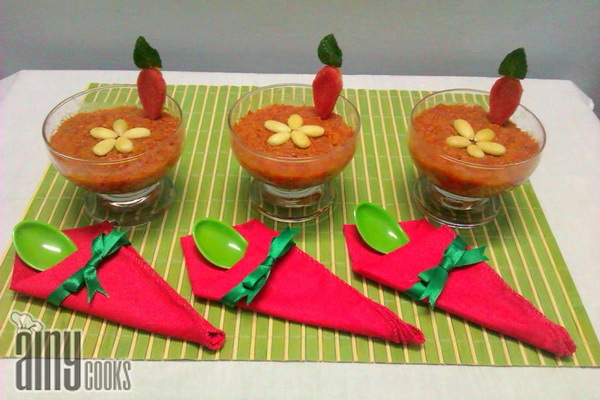 AOA, AINY COOKS AND MEMBERS ITS CELEBRATIONS TIME MANY MANY CONGRTS TO AINY COOKS AT BLOG’S ANNIVERSARY.MORE N MORE BEST WISHES FOR UR SUCCESS IN FUTURE AS BEFORE.THIS TIME I CAME UP WITH MY MOST FAVORITE AND AINY COOK’S MOST POPULAR RECIPE CARROT HALWA IN MICROWAVE.HOPE U ALL WILL LIKE IT. Many Many Congratulations dear …..I wish you all the best for your life, may you continue to achieve great heights.I’m really touched by your kind words and thoughts, thank you so much.